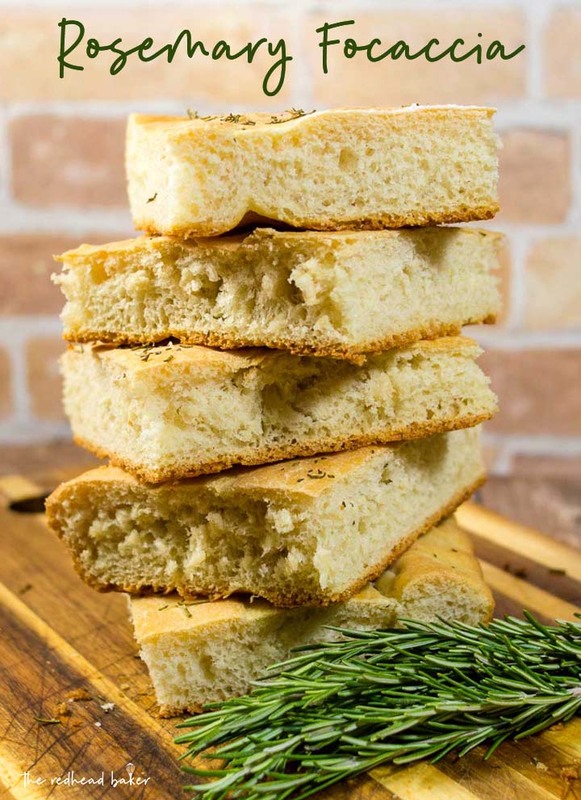 Focaccia is an Italian flat bread similar to the crust of Sicilian pizza. 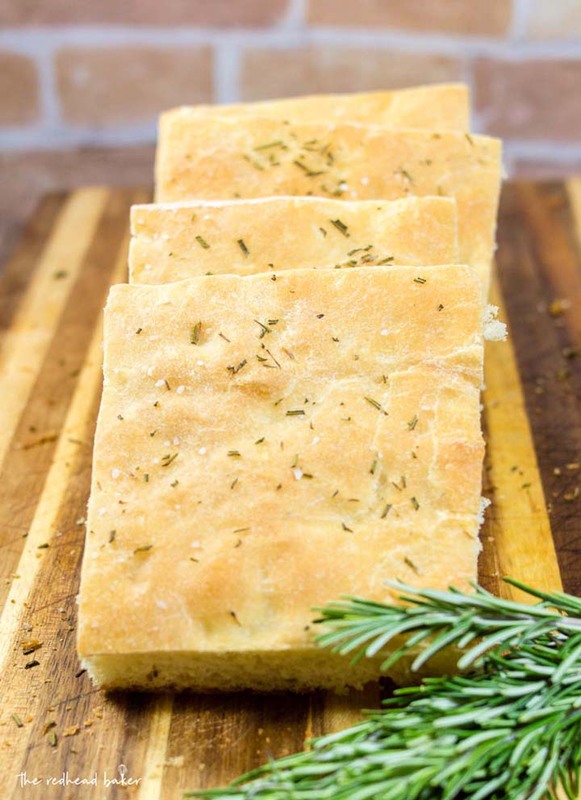 It is moist, chewy, and topped with savory rosemary. This recipe was originally published in August of 2010 and has been updated with new photos. 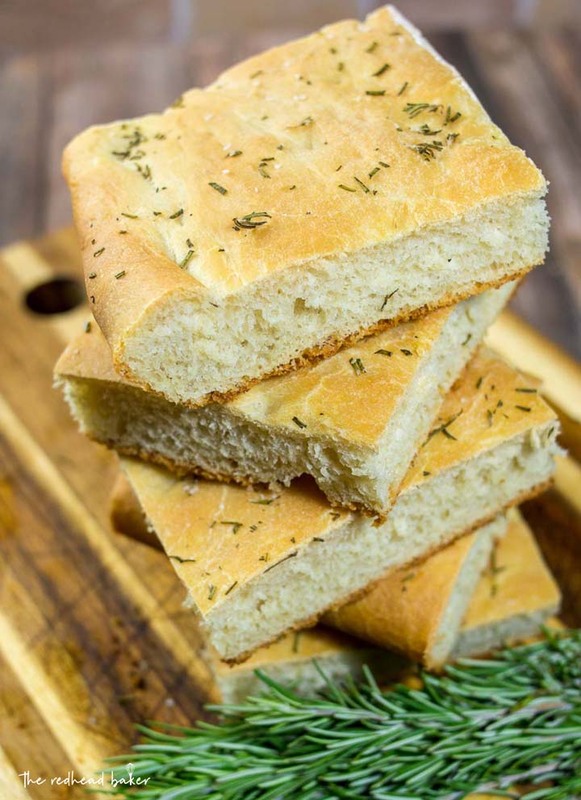 Focaccia is one of my favorite foods. I first made it in culinary school, and it was okay. But then I took an internship at a local bread bakery, and it was the most delicious bread I ever tasted. Similar in thickness and texture to the crust of a Sicilian pizza, this bread is moist and chewy. Along with a bit of Italian cheese, I can make a light lunch out of a slice of this bread. It is also a rather easy bread, so I encourage you to try it even if you’re not an experienced bread maker. Just remember the yeast is a living thing, so follow the instructions exactly, especially regarding water temperature. Water that is too cold will not activate the yeast; water that is too hot will kill it. Also be sure not to skimp on any of the rising times. Mixing and kneading the dough helps form gluten, a protein that helps bread keep its structure and makes bread chewy. But too much gluten will make your bread as heavy and dense as a rock, so the resting time is vital to allowing the yeast to grow and the gluten to relax. If you’re not a fan of rosemary, you can use other fresh herbs in its place. Alternatively, you can bake the focaccia without any herbs and spread pesto onto the baked bread. You can also sprinkle shredded cheese or caramelized onions onto the bread just before baking. This dough holds up very well to being frozen. If you have smaller baking pans or a 9-inch round baking pan, you can divide the dough in half. Shape and bake one half of the dough as directed below, reducing the baking time, and wrap the other half in a double layer of plastic wrap and freeze to bake at a later date. Measure flour into mixing bowl of an electric stand mixer. Measure salt onto one side of flour, and yeast onto the other side (if the two touch now, the salt will kill the yeast). Mix on low speed with paddle attachment, adding the water and the olive oil, for about 3 to 5 minutes, until it comes together in a smooth, sticky dough. Switch to the dough hook attachment, and knead on medium speed for 5 to 7 minutes, until dough forms a smooth, sticky ball which clears the sides of the bowl, but sticks to the bottom. You may need to lighlty add additional flour to make the dough firm enough to form a ball, but it should be very soft and sticky. Sprinkle a 6x6-inch square of flour on your countertop, and using a bowl scraper, remove the dough to the floured counter. Dust liberally with bread flour, and pat into a rectangle. Allow to rest for 5 minutes. Coat your hands in flour and stretch the dough from each end to twice its size. Fold each end over itself, like folding a letter and give it a quarter turn (90-degree turn). Dust with flour, and cover loosely with plastic wrap. Allow to rest for 30 minutes. Repeat Step 3 two more times, the last time allowing the covered dough to ferment on the counter for 1 hour. The dough will swell, but not double in size. Line a 17x12-inch sheet pan with parchment paper, and drizzle about 1/4 cup of olive oil onto the paper, and spread it around with your hands or a pastry brush. With oiled hands, gently lift the dough onto the parchment, maintaining the rectangular shape. Use your fingertips to simultaneously dimple the dough and spread it to fill the pan. Use ONLY your fingertips! Keep the thickness as uniform as possible, for even baking. If dough springs back too much, allow to rest for 15 minutes, then continue. Don't worry too much about filling the pan entirely — when the dough proofs, it will naturally fill out the pan. Loosely cover the pan in plastic wrap and refrigerate overnight (or up to 3 days). Remove the pan from the refrigerator 3 hours before baking. Drizzle additional olive oil over the dough surface and dimple it in. Sprinkle the chopped rosemary over the entire surface of the bread. Cover with the pan with plastic again and proof the dough at room temperature for 3 hours or until the dough doubles in size. Preheat the oven to 400 degrees and place a rack on the middle shelf. Place the pan in the oven. Bake for 30 to 45 minutes, until the focaccia becomes a light golden brown. Remove the pan from the oven and immediately transfer the focaccia out of the pan onto a cooling rack. 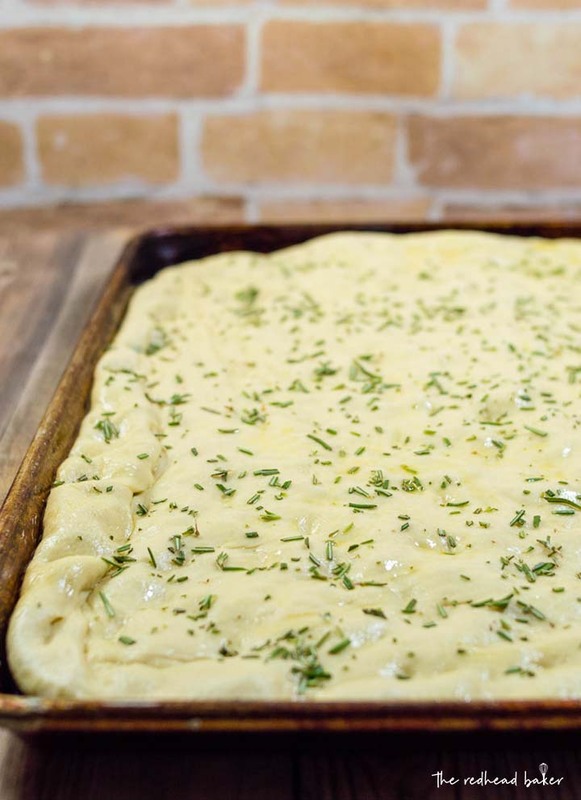 Remove the parchment from the bottom of the focaccia, if it sticks. Allow to cool at least 20 minutes before slicing and serving. Wrap any extra slices in individual packages of plastic wrap and store at room temperature for up to 3 days. Yum. It looks perfect for some extra dipping oil! I love focaccia and this looks lovely. I love the chewiness of focaccia and the herb/salt topping just makes it even more special! I really enjoy focaccia when it’s from a good bakery or homemade too, and yours looks lovely. It’s so good for dipping in a good oil or split to make a sandwich. It’s been forever since I’ve made focaccia and I have tons of rosemary in my garden. This will be on the menu soon. I have made this focaccia, and love it, and that book too. Gorgeous new photos! I’ve not made focaccia myself yet. Love the addition of rosemary here. Pinning this one, I’m attempting an herb garden this year and rosemary is definitely on the to-plant list! Recipes like this are the reason I will never be thin!!! Looks yummy! Mmmmmm! I love how golden that looks amd there is nothing like fresh bread. Now I need some! I love focaccia bread! This Rosemary version sounds so so good!! That is delicious looking focaccia bread! Love the rosemary sprinkled on top! 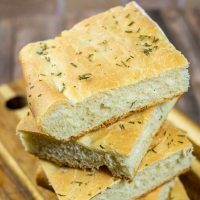 I have never made focaccia, but this makes me want to give it a try! I love that you added rosemary to it. 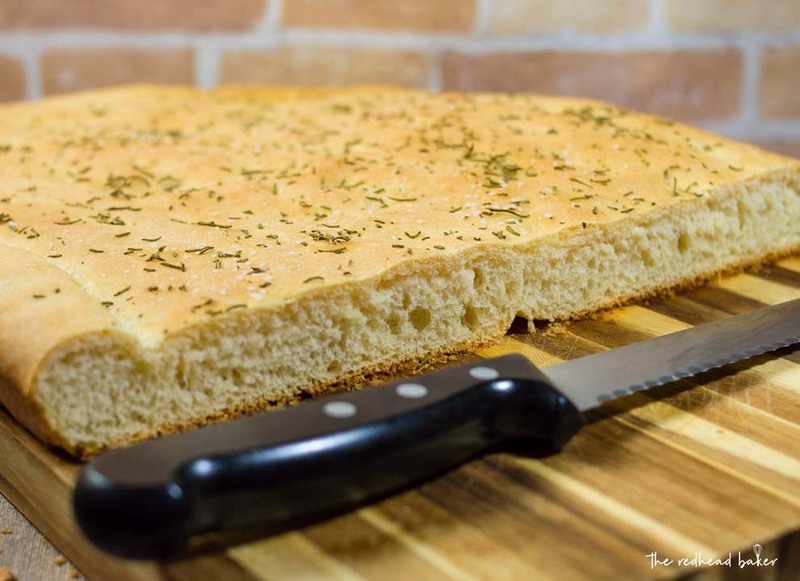 Can’t beat homemade focaccia bread – so good!